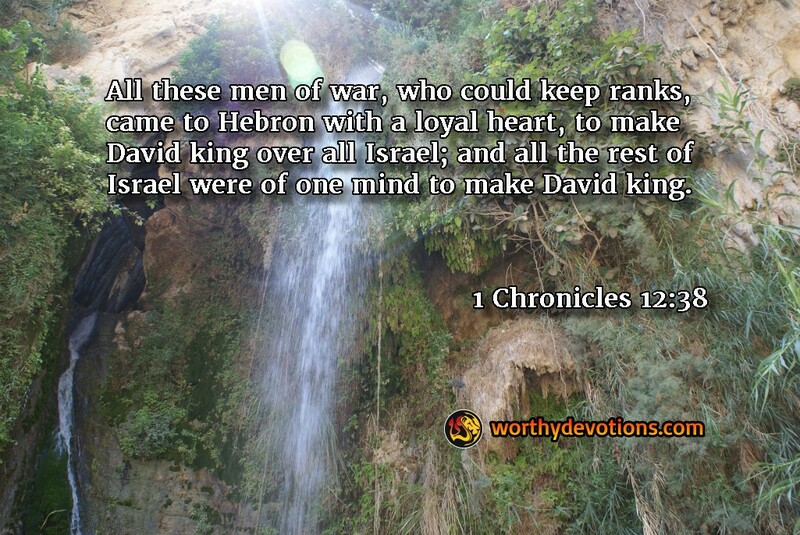 1 Chronicles 12:38 All these men of war, who could keep ranks, came to Hebron with a loyal heart, to make David king over all Israel; and all the rest of Israel were of one mind to make David king. The mighty men that followed David were of one mind and heart to make him King. Their recognition of David's anointing may have been the most significant quality of these Mighty Men. What was it in David that drew out this deep loyalty? I believe it was God's Holy Spirit which David received when Samuel anointed him king. [1 Samuel 16:13]. "Mashiach" literally means "anointed"; so David was a "mashiach". "Yeshua ha Mashiach" translated literally into English is, "Jesus the Anointed". David received the Holy Spirit from the moment of his anointing by Samuel as future king of Israel. As the anointed Son of David, and Son of God, Yeshua is our eternal king. The anointing on David's life, and the unity of his mighty men and their devotion to make him king, inspired all of Israel. The entire nation was inspired to crown him their king. What a picture of spiritual unity for us as lovers of our King/Messiah! If we love our King the way they loved David, we will also be drawn into great unity of heart and mind, as they were. Now, as the storms gather, as our enemies plot our destruction, we must realize and recognize our oneness in Yeshua. Whatever disagreements we may nurture, they must pale in comparison to the love and loyalty we share toward our beloved King. Just as Israel loved and was utterly devoted to David, so, even more, can we be drawn together by the magnificent anointing of our Messiah, King of the Universe. Go into the Highways and Byways! Become one with a Perfect Heart! You are chosen and changed! Sign me up for your devotional! or you can donate online. Simple, Safe & Secure! Click here! 1999-2019 Copyright © Worthy Devotions - a division of Worthy Ministries.